Abstract of the 2012 George Watt Memorial Award in the Graduate Category. Read the full winning essay here. 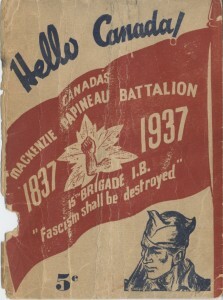 In the latter half of the 1930s, 1,700 Canadians journeyed to Spain to defend the elected republic against General Francisco Franco’s military revolt. Decades later, as these men approached old age, they began pressing for official recognition from the Canadian government for their service in Spain; they were ultimately unsuccessful. A close analysis of these veterans’ twilight years provides valuable insight into the nature of both collective and historical memory. The campaign for recognition illuminates a moment in the veterans’ lives when their collective memory of the Spanish Civil War was on the verge of disappearing and they contemplated how their experiences should be preserved as historical memory. The veterans faced the difficult task of presenting their case in a manner that would downplay their extensive ties to the Communist Party of Canada but also highlight their commitment as anti-fascists. With this in mind, they chose to portray themselves in the same light as veterans of World War II, a group held in high regard throughout Canada. During the campaign, a concerted effort was made to demonstrate that Canadians who served in Spain fought the same enemy the Canadian military encountered in World War II. The veterans’ overarching goal of ingraining themselves in Canada’s historical narrative as “patriots” meant that only certain memories of the war could be preserved. Therefore, the memory of anti-fascism they promoted during their campaign was largely de-politicized and removed from its origins in the Communist Party and other progressive movements of the 1930s. This study of Canadian veterans pushing for official status adds another dimension to the literature on the International Brigades and the politics of memory.